There’s a fascinating discussion going on at She Writes about what constitutes the perfect writing day. I wake up having had enough sleep. This is important – if I’ve had one of those nights where it feels as if the world’s traffic has been using my brain as a concourse I can forget about writing. The day will be with one with nothing else in it. The ‘to do’ list I revise each evening and leave for myself in the centre of my desk will have one word on it: writing. Tea (strong, with a little milk), a bowl of high-energy cereal, then a brief venture outside. I walk the few steps to the garden gate and peer over it. Two giant Ash trees grow opposite and I watch them for a moment, thinking how Virginia Woolf described taking ideas to her writing hut each morning like a delicately balanced basket of eggs. If whatever I am writing is already well advanced I start as soon as I get to my desk. If it isn’t – if I am still feeling my way in to the characters and their story – then the process of beginning takes longer. Sometimes all I achieve are notes. I force myself to exercise at the end of the morning: yoga, aerobics, if the weather is good a walk or run. My reward is lunch which I eat listening to the words in my head, outside if I can. Unlike most writers I know, I always do my best work in the afternoons, beginning about 2 and working through to 4 or sometimes 5. After this, no matter how well the writing is going, I come to a natural stop. I look forward to my son returning from school, to switching on email and letting the world flood in. Oh, and my perfect writing day ends with the knowledge that tomorrow will be exactly the same. After a talk to the Arts Society at Newnham College in Cambridge last night I had an interesting discussion about the differences between literary criticism and creative writing. The talk was to launch a new journal Women and the Arts, celebrating Virginia Woolf’s lecture to the Society in 1928. Woolf later reworked her lecture as her seminal essay A Room of One’s Own. Woolf was constantly in my thoughts as I spoke, not only because I was talking about my fictional account of her life in Vanessa and Virginia, but also because so much of what she said in 1928 about the necessary conditions for exploration and creation remains true today. We still need space (‘a room of our own’) where we can work without interruption; we still need money so we have time to sit in that space. 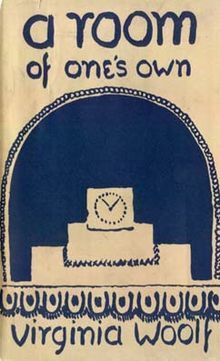 In her lecture, Woolf was talking partly about women’s writing (which in 1928 was still markedly absent from the literary mainstream despite notable exceptions), but also about all manner of intellectual and inventive enquiry as encapsulated by her two imaginary female scientists, Chloe and Olivia. But the discussion after my talk was about writing, and specifically about how as critics we learn to focus on a text’s details so our understanding of the way a particular passage or sentence is crafted becomes highly sensitised. This can make it paradoxically harder for us to write creatively since we scrutinize every phrase we put down – and stumble on its flaws. How, a young writer asked me, can we turn off that critical eye so we can launch into the mess and flow of original production? This is a crucial question and one that isn’t confined to literary scholars. Reading sharpens our appreciation of what words do and this can impede our efforts to write. We all know the pattern. We stall before we’ve decently begun because some negative, querulous voice forces us to revise what we’ve just written – and then revise it again. We get up from a hard-earned session in that ‘room of our own’ because we persuade ourselves we’re too tired, or too preoccupied, or too uninspired to write today. Woolf has a good answer to this conundrum. She has an image of herself with a devil-angel on her shoulder, detonating her confidence with doubts and contrary thoughts. In Woolf’s case the source of the devil-angel is the Victorian ideal of perfect womanhood – but though that particular goddess no longer stalks us, others have replaced her. Woolf’s solution is radical. She argues that we must take the point of our metaphorical pens and stab these devil-angels before they destroy any chance we have of writing ourselves. I agree: we have to do whatever is necessary to quell these disabling voices. We have to build into that ‘room of our own’ permission to write without censorship. We have to create a space where we can experiment, explore, set off into the unknown: somewhere we can make mistakes. Otherwise we will never reach that alchemical point where writing begins to transport us, suggest possibilities we have not thought of, expand the range of what we imagined possible. This is not the whole story. Whatever writing we produce during our journey has to be reworked. There will be superfluity, confusion and error mixed in to our work, which we will need to eliminate before it sets. We must review what we’ve written and decide how we will communicate it to others. Which is where that critical eye comes in, trained up by our years of reading. At this point in the process it’s an aid, not a curb. The editing process is a different operation to that early one of exploring and experimenting and calls for a different mindset. Or perhaps it just requires us to make an adjustment to our room. Stephen King insists we should write with the door of our writing room closed in order to give ourselves privacy and the freedom to embark. He suggests we should open that door when we edit, considering our potential audience as we draw on those finely tuned critical skills. I think this is helpful. At the beginning of any creative endeavour there has to be a ‘closed door’ period where we can immerse ourselves fully, give ourselves permission to experiment and dare. We can then follow this with an ‘open door’ period where we review what we’ve done – before sending our work out through that door into the world.